Since 1990, The "Original" Moonlighters have been performing throughout the United States as one of the country's best-loved and most authentic Motown and variety dance bands. Averaging over one hundred appearances per year, The "Original" Moonlighters offer affordable quality, specializing in weddings, corporate events, private parties, festivals, and concerts, with an emphasis on strong, soulful vocals and solid instrumentation. The best decision I made for my wedding, besides choosing my partner, was selecting the Original Moonlighters as our band. Our wedding was somewhat intimate with 60 guests, ranging in age from 18 to 77. We were concerned about finding a band that could appeal to such a broad age range with eclectic musical tastes, but this band more than appealed to our guests. They had everyone on the dance floor smiling and having a spectacular time. The band included two vocalists and four instrumentalists for a three-hour event that included the dinner hour and two hours of dancing. For the dinner hour, the band played beautiful jazz music, which allowed the guests to enjoy their dinner and conversation with soothing music playing in the background. The dancing portion of the night kicked off with the song, At Last by Etta James that was beautifully performed by their female vocalist. In fact, I think she sounded better than the original artist. From there, the band transitioned smoothly from one genre to the next with pure talent. Almost all of the guests were on the dance floor throughout the night dancing, laughing and having a great time. 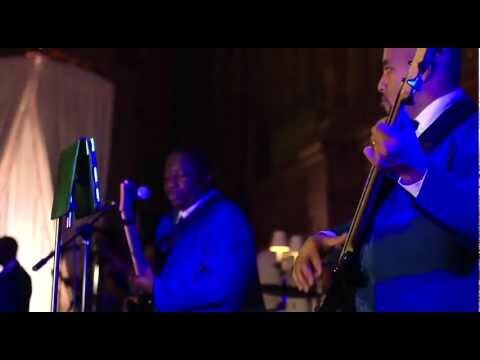 Not only was the music by this band flawless but they were also very professional, fun, easy to work with and even attired themselves in my wedding colors. 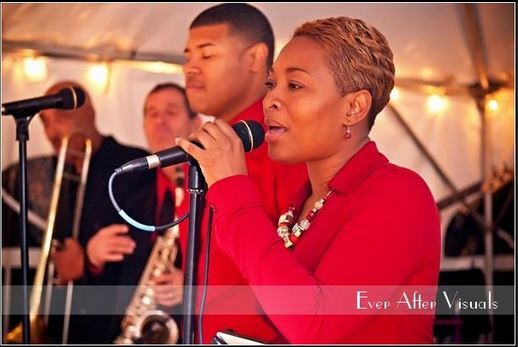 You cannot go wrong in hiring this band; they will make your wedding event the talk of the town. The Original Moonlighters are a legend. People talk about bands that elevate a mere party to the status of a mythical event. People talk about bands that can speak to everyone: young, old, white, black, local, and foreign; bands that transcend these separations. In my life as a former wedding caterer, I’ve seen dozens of wedding bands and DJs show up, play some music and leave. Very rarely does a band even manage to make any kind of difference, let alone transcend division. The Original Moonlighters not only manages to transcend, but now exists in the mind of our wedding guests of our mixed-race wedding as the band responsible for creating the best time many of us have ever had. Their musical knowledge and skill are considerable and impressive, but even skilled musicians are a dime a dozen. What sets The Original Moonlighters apart is their openness, attentiveness and care. They willingly learned our favorite song for our first dance and it was amazing! They have mastered the elusive and subtle skills of reading the room and caring about what each person actually felt is a good time. Everyone at the reception from 90 year old world-traveling grandmas to down-south country cousins to hard-working family from the mid-west to teenagers to 5-year-olds who have never heard most of the songs previously got up and danced until their legs went out. They helped us to see that even though we all may be from different places, have vastly different experiences, and different skin colors, we are all one family. The band wasn’t just folks who played at our wedding --they were a true part of it. We are deeply grateful for their performance, care, and emotion. We wholeheartedly recommend them for your wedding. Their music is beautiful and the emotional memories it will leave in your heart are easily worth their reasonable and fair booking fee. Don’t wait, book them now. This is our third event with the Moonlighters (all Bar/Bat Mitzvahs) and this time they totally outdid themselves. They were rocking!! We can’t thank everyone enough for the fantastic show they did for our daughter's Bat Mitzvah. Every song was incredible. When they sang Purple Rain, I could swear that Prince had been resurrected. So many people at the party raved about the band and even those who were not dancing were listening and grooving wherever they were. Kids and adults alike. A cousin of mine who is in a jazz band himself (saxophone) commented how much he loved the Moonlighters’ music and how clean and together they sounded. A special thanks for bringing the additional two band members, what an incredible surprise! The horn section was super!! As usual, the Moonlighters went above and beyond, and integral in making our party a huge success. We are done with the “mitzvahs” but hope we can hire the band again for a future celebration. Thank you, Moonlighters!! The Moonlighters played at our annual school fundraiser. They were energetic, sounded great, and kept people on the dance floor all night long! Professional, fun, and easy to work with. Would definitely hire them again. Just wanted to say, you need to hire these guys and gal ASAP...they're so easy to work with and always put on a show!!! We heard them at a friend's wedding and booked them 2 weeks later: Best. Band. Ever. Yes, they do!!! I've been to Tons of weddings with boring DJ music, so we decided to hire a live band covering all the classics and top 40 hits. But the Moonlighters pretty much know every song in the universe, so it was an easy decision. Pricing was reasonable, they took all our requests, and even personalized some songs with our names...now how cute is That??? But when they let our family members on stage, singing a couple songs with the band, it brought the whole house down!!! You guys totally rock, and we're already making plans to book you again for our family reunion next year. Great experience! We danced the night away! Excellent, fun and professional band. Highly Recommended. We have booked the Original Moonlighters two years in a row for our lawn party for about 140 people. What a great, professional and fun group! They were super entertaining, a lot of fun and got people up dancing right from the start. They were prompt, set up without any hassles and played a lot of songs. This year, we got caught in a brief but wild thunderstorm just before the event. Under the tent, still got wet and the wind blew things all over. The band, just set everything back up again and went to work. It was above and beyond my expectations. Highly recommended for your event, no matter what it is! The “Original” Moonlighters performed at our daughter’s wedding reception on May 5th at the Potomac View Terrace. We first learned of the band when they played at our goddaughter’s wedding a few years ago. The Original Moonlighters perform a broad range of music as you can tell by viewing their website. We have received many favorable compliments about the band’s performance from our guests, as well as our daughter and new son-in-law. In addition, we found their manager to be responsive to our inquiries and requests and would highly recommend you consider them for your event. We are sure you won’t be disappointed. Truly the BEST in the Biz! The Moonlighters were a hit! They played phenomenally and really got the crowd moving! The shout-outs to different presidents and their favorite songs were especially appreciated. Please be sure to pass along my thanks and congratulations on a fantastic show. We had thousands of people in the courtyard on Saturday and the music helped create a really great atmosphere. This band was THE BEST! We had an international group of childhood cancer leaders who wanted to experience Motown and have fun and the Original Moonlighters did just that! I've received feedback from around the world that this was the best time in their lives! Am trying to think of another event I can plan to book them again! Were a perfect fit for our gala after party! The Moonlighers were so incredibly professional and easy to work with. They needed little direction from our team and were gracious, fun, and flexible. People absolutely loved them and I hope we can have them back soon! Cannot say enough about how amazing The Original Moonlighters were at my wedding! We had 190 people at the wedding and as soon as dinner was over everyone was up and dancing for the entire reception. We had the 9-piece band and highly recommend them. We were thrilled with how many genres they could cover from oldies to Motown, pop, funk, rock, etc. Their musicians handled cocktail hour with a solo keyboardist and a dinner jazz trio as well. It could not have been easier working with the band as they were always accessible by phone and email. My wife and I could not be happier with the band, don’t hesitate to book them! Thanks to The Original Moonlighters for making our day that much more special. This is not the group we got. We requested this group to play at our event. The member that showed up said they had been notified last minute and needed them to pull together to this show. Some of them not even knowing each other at all or had never played a gig together. NO REHEARSALS. This was a sold out event for me and I had to refund every single one of my guests because they expected this group to show up and they did not. They took on another higher paying gig and sent me NOTHING close to what they promised. The show they sent me looked like something out of a Karaoke Night. A mess!! It was a nightmare. Make sure when booking this band that you are getting what they are selling. Why is this being posted almost two yrs. later with a fake 2016 date? Is it because we declined your request earlier this wk. for a 'free' performance? Back in 2015 you posted pics/vids. showing guests enjoying the event. The band received TONS of compliments. And after mentioning that some, but not all, ticket sales were being refunded, you wrote: "Things happen, we fix it and move on. Your back up group did a great job and our guests has a nice time..." Originally booked for June, the date was changed to July and then Oct., finally confirming with us only TWO wks. prior...after your company's bank account was frozen! Of course our regular musicians weren't available with such short notice, but the show must go on. You also told us it was just a casual event, increasing the # of hrs., which we then agreed to honor at the same rate. Despite signing off on providing sound, that was another empty promise. Beware of this client: dubious dealings and misleading communications throughout! The Original Moonlighters were the BEST wedding band!!! We wanted a good variety of songs that kept everyone dancing all night, and they delivered and then some! Their musical talent was awesome, and the playlist couldn't have been better. They were also ready to roll with the punches when unplanned things occurred, like an over-served groomsman jumping on stage and being the lead singer for an entire song, or when they broke into an impromptu version of "The Stars at Night" on the trumpet for our guests, half of whom were from Texas. They were absolutely incredible and just MADE our reception. The dinner music they played was classy and made us feel like we were at the most chic of events, and the dance music after dinner was just so much fun. They are laid back, easy to work with and receptive to ideas. They're great at MCing the event, as well, and keeping a good flow throughout the evening for things like the cake cutting, first dance, intros, bouquet toss, send off...and "Shout!" as the last song was the best three minutes of my entire life. They're awesome, and a great price for this area. BOOK THEM!!! 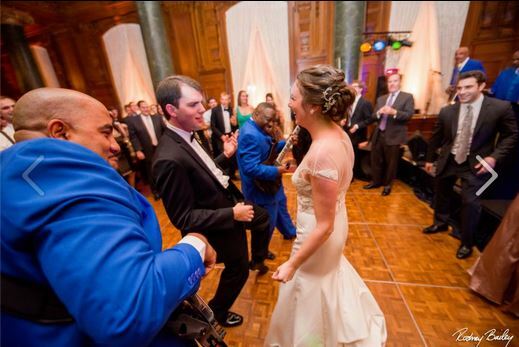 The Moonlighters were a highlight of our wedding and kept everyone dancing for hours. They did a great job as emcees for the night, and played a variety of music -- perfect for a mix of ages and cultures. Can't say enough good things about the band!! WOW! We were beyond thrilled with the quality and sound of the Moonlighters at our wedding. They were professional, extremely talented, and had everyone raving about what a great band they were. We are so glad that we hired them as our band and have great memories of our evening and they were a big part of it! They made my wedding. Velvet voices, soothing sounds, dressed in tuxedos. Everyone loved, loved, loved the band. They sung every request we asked, effortlessly. The band was prompt, and professional. After my groom, gave me a toast.....they played a song that reflected the moment perfectly. It was a great time. If you want a stellar Motown band do not hesitant to contact the Moonlighters. I am already planning to hire them for my party next year. Great Band. Outstanding performance, we received several congratulations from attendees about the Moonlighters. Helped us with annoucements and scheduling during reception while putting on a first class show that had folks dancing all night. Highly recommend. Great band. They were easy to work with, accommodated my two requests and did a good job. Everyone at the wedding was very pleased with their performance. The Moonlighters did a fantastic job at our wedding! They brought such wonderful energy to the room. Everyone was dancing until the very end. Vance also was wonderful. I spoke to him a week before the wedding and he completely put my mind at ease that everything would be taken care of and it definitely was! I couldn't have been happier with them. I would recommend them in a heartbeat (and already have!). Thank you Moonlighters!!! We had a "Barn Dance" - The Moonlighters ROCKED the house. There were 1,000 people there and they were mostly dancing from beginning to end. Afterwards, half of them asked for the contact info. If you want a party, if you want dancing, if you want classic soul....the is where you go! No Question! What a fantastic band! They started on time and played without a break, despite the intense heat outside. Songs were perfect for our guests, and everyone enjoyed the music. My only regret was not booking them for a longer timeframe, as they left us wanting more. All band members were professional, friendly, and easy to work with. Can't wait to have them back for my next party! Amazing band! Really engaged the audience, enthusiastic, outgoing, extremely talented. Would recommend for any party/event...had us dancing the night away! The Moonlighters were FANTASTIC!! They set the mood for the entire evening and were even able to get some of the guests out on the dance floor...which is saying a lot with this group! I would definitley recommend them to friends and family for future events. The Moonlighters were fantastic! Leading up to the event, their manager was very accommodating and professional. At our reception, the band sounded great and everyone was dancing! We received so many compliments on the band and they really helped make our reception a resounding success! We all enjoyed the Moonlighters. They got everybody up to dance! Wonderful!!! The moonlighters were amazing! Great music, nothing to complain! I'm so happy we booked them for our wedding! Avo and I could not have been happier on Saturday!!!! You guys were incredible, we were absolutely blown away- and I can't count the number of guests who commented on your awesomeness:) We can't thank you enough for your talents, hard work and professionalism- so THANK YOU and each member of your amazing band... We were truly impressed!!! We searched for months in order to find the PERFECT wedding band for our event. And then we saw The Moonlighters at a friend's wedding. They were absolutely incredible!!! This is the first time we've ever seen the entire dance floor packed from beginning to end. 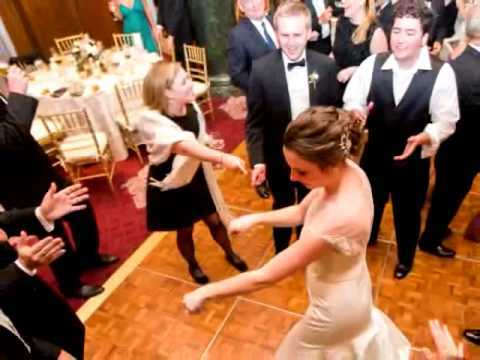 So we hired them for our wedding, and even our non-dancing folks were shaking it...we were shocked, lol! They're really friendly and easy to work with, answering ALL our questions, taking requests, learning songs etc. People are still asking us about our amaaazing band!!! And thanks to them, it was truly the BEST day of my life...thanks Moonlighters! Music is THE most important part of any event. And there are many choices out there. But when you hire The Moonlighters, you are hiring the very best in the business. Providing a level of service second-to-none, during your event and in the many months before, we manage ALL the details. We'll answer every question, offer suggestions based upon almost twenty-five years of first-hand experience, AND provide the finest show absolutely possible. Nobody else offers the same level of attention, quality or value. Famous for getting guests out on the dance floor and more importantly, for keeping them there, The Moonlighters are experts at reading the crowd and gladly take requests, making their performances highly entertaining and interactive as audiences just feed off the band’s energy and vice versa. They can also be booked in several different combinations to fit any budget and venue from just two or three musicians to as many as ten or twelve, including one of the tightest horn sections in the country and some of the finest male and female vocalists anywhere. Meticulously-groomed and costumed, whether it’s for ceremony, cocktail or dinner music, a casual outdoor reception or a classy black-tie affair, The Moonlighters have a show custom-tailored to best suit any theme. Featuring HUNDREDS of songs in a wide variety of styles, they do it all very well. Critically-acclaimed, they have performed an unprecedented seven times at The Kennedy Center, for countless political and business leaders, at various foreign embassies, and other prestigious venues, covering well over a dozen different states, including: DC, MD, VA, WV, DE, PA, NJ, NY, KY, TN, OH, IL, IA, NC, SC, GA, FL, UT, and MT. As seen again and again in their many rave reviews, thousands of appreciative listeners and hundreds of satisfied talent buyers all agree, The Moonlighters are dedicated, professionals truly committed to making each and every show an event to remember. But of course, they're in heavy demand with a schedule that always fills up fast, so don’t delay…please contact them today! We are completely self-contained. But enhanced sound, lighting, portable dance floor, stage, DJ and even professional dancers/dance instructors can all be provided, upon request! (c) 1990-2013 The Moonlighters/14K Music. All Rights Reserved.